We have officially begun our 2006-2007 Class of AmeriCorps!!!! (Insert fireworks and whistles and applause here!) I would like to welcome each and every AmeriCorps member who is taking on the challenge to teach kids that it's "Hip to Be Fit: Mind, Body and Soul!" Our new year always kicks off with a bang. We are heading to UCI for our orientation retreat this year. 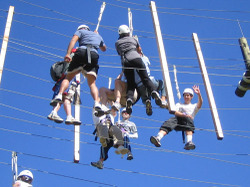 With "Camp AmeriCorps" as our theme, our orientation wouldn't be complete without some old fashion ropes courses! Team Up will be providing everything we need for a fun and exciting day! Here's a sneak peek of what's to come for our AmeriCorps members this weekend! 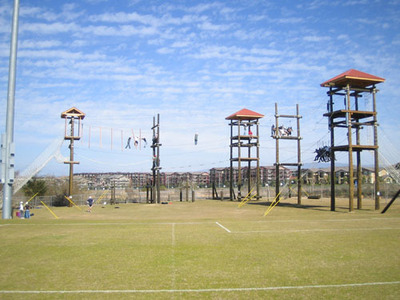 Agencies who are interested in Team Building Opportunities can contact the Outdoor Adventures staff at UCI for more information! Come back for more of our members in action at the retreat! 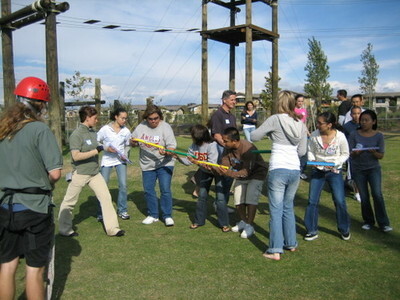 It is sure to be a weekend of teambuilding, bonding, and education! We'll throw some fun in there, too!